These words have become such humdrum lyrics to a catalytic rhythm ever since I heard them reverberate so easily from others’ mouths and so swimmingly inside my head. Each word bouncing back the afflictions encumbered by every echo like a taunting memory, unwanted yet enlivened. And I gave them life by letting them live inside my mind, growing synchronically with my own natural growth. The older I got, the more pronounced they became — trumpeted with distinct loudness at every introducing moment of vulnerability. The words soon multiplied, forming new bodies of shame to find homes in the pockets of my misery, seamlessly woven in my candid cavities. I was trapped by words I never invited in. By slews of judgments thrown at me with thoughtless force and I caught them, carried them, because I didn’t know any other validation other than to take what was given to me. But also because I didn’t fully understand what they really meant — I just knew how they made me feel in the context of their conveyance: a sunken pool of terrible, ugly self-hate and shadowing shame. How do these empty words carry so much weight? How have these colorless commands come to define me? I trusted the world around me to help me gain perspective on the unknown such as these but along the way, I lost the reigns and let everything else dictate my own world and how I viewed myself through the lens of ignited illusions. I saw myself as crazy, insane, wrong, mad. Words meant to lessen my internal synergy and overshadow my genuine intentions, and the worst part is, it wasn’t even my choice. But my life is a collection of own choices, and I choose to want to be all those things. I want to be crazy, insane, wrong, mad if it also means I get to choose to be crazily happy, insanely intentional, and madly in love with myself. My mind isn’t madder because it matters. In all ways. When I thought of Mind Over Madder, I didn’t intend for it to differ from the phrase “mind over matter”. In fact, I meant for it to be a natural play off the already-familiar idiom. The idea was to help reshape our everyday language, dissect apart the perceptions pre-determined by our society, and reassign our own peaceful understandings in ways that rise above the catalogued definitions of insanity. 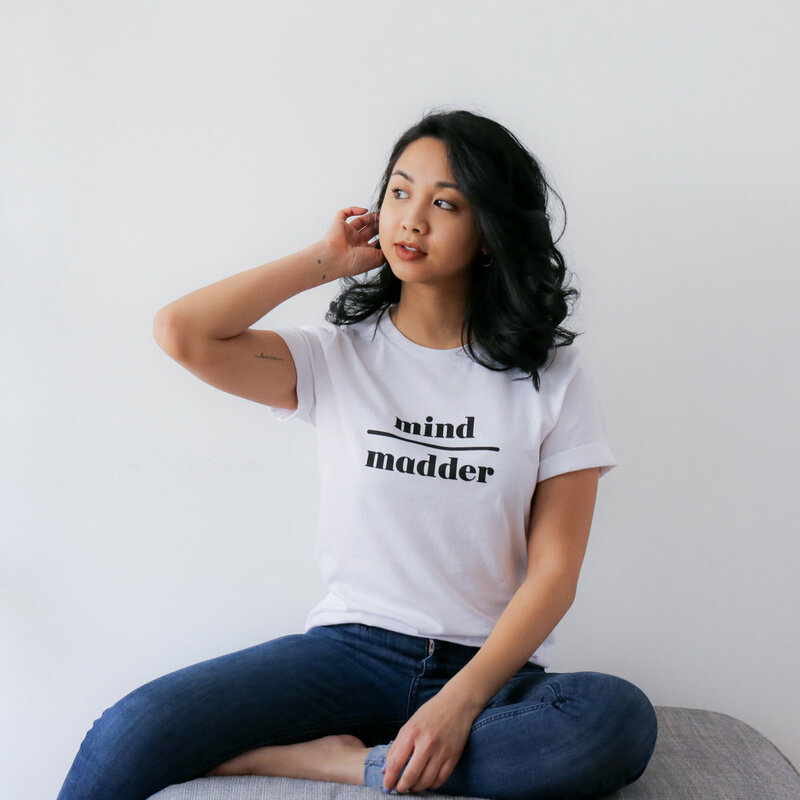 In this, we are openly and comfortably inviting in stigmatic topics such as mental health into our casual conversations, in hopes of dissolving negative biases and collectively shed light onto a significant aspect of our everyday existence. 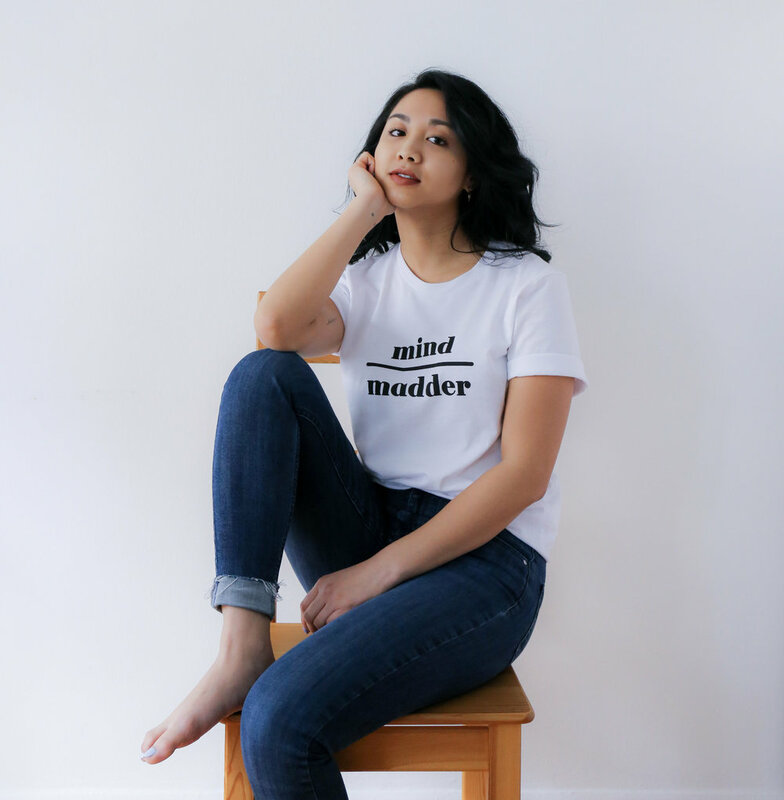 Mind Over Madder means to flourish above the detrimental judgements of being “crazy” or “mad” by someone else’s illusion, and remind ourselves that our minds are our own — no one or no thing can label them as otherwise. So when we say mind over madder, or matter, we are saying that we empower ourselves from within first, regardless of unwelcoming foresight. I knew I wanted to do something more out of this idea of Mind Over Madder. I had the phrase, but I didn’t know how to broadcast the message in a grander and impactful scheme. I already use my social media platforms to help further advocate for those struggling with their mental health, but I felt that this deserved more than a digital dialogue. 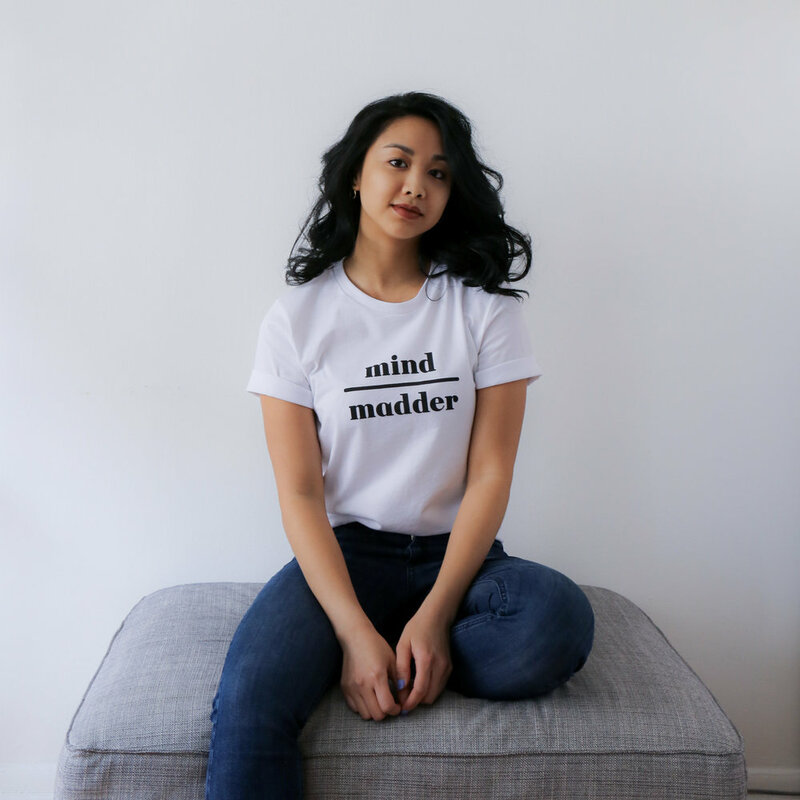 Then I met Alexis Mera through We Are Women Owned, and learned that she started a business of creating custom t-shirt designs in collaboration with female entrepreneurs, leaders, trailblazers, etc. to bring their stories to life. So we connected and the rest just catapulted from there — a meeting of creative minds to bred this powerful message of mental health and my movement in support of it. Read my interview about the story behind this t-shirt on Alexis Mera’s blog here. The shirt is $40 and can be purchased through this link here. 5% of every sale is donated to NAMI, the National Alliance on Mental Illness. It is the nation’s largest grassroots mental health organization dedicated to building better lives for the millions of Americans affected by mental illness. I align with NAMI’s mission of educating, listening, and sharing stories. They are open to any and all help in growing this movement that it makes me feel more determined to contribute to the allied cause. They are completely American made, eco-friendly, 100% sweatshop free. The factory Alexis works with is 100% sweatshop free and eco-friendly. Its efficient dye machines save over 24 million gallons of water a week. Any water that gets used goes through a filtration system so it can get recycled. Solar energy powers its sewing and cutting facilities and garment cutting is optimized to eliminate waste and prevent materials from going to landfills — excess fabric is recycled into other things like baby bibs or stuffing for upholstery. Screen printed by hand and no harmful inks. Each design is screen printed by hand at a small print shop in Brooklyn, NY using water-based ink. There are no resins or plastics, making water-based ink not only better for the planet, but it absorbs better, so the design becomes part of the shirt rather than sitting on the surface. Thank you for supporting my Mental Wealth mission and being a part of this movement to better each other’s mindful lives!